Cathy Potter is a school librarian at Falmouth Elementary School (FES) in Maine with a population of 935 students. She taught 5th and 6th grade for many years before she decided to take the plunge and become a school librarian. Her passion has always been literacy and she enjoys integrating technology into all areas of the curriculum. When FES built a new K-5 school they updated their technology to include iPads for students to use in their classrooms and the library. Cathy wanted students to be able to listen to audio books during literacy instruction or silent reading, and also continue listening at home in the evening. Cathy realized FES would need audio books for their K-5 collection, but purchasing hundreds of books on CDs didn’t seem like the best solution. The CD audiobooks the library owned were often damaged or missing discs, and only one person could check out the audio book at a time. Cathy motivates FES educators and students to use Tales2go in a variety of ways throughout the school day and at home. Several fourth grade teachers use the audio book Lost on a Mountain in Maine as a read aloud during their Maine geography unit. A second grade teacher sets up listening centers in her classroom by using headphone splitters so that multiple students can listen at the same time. A number of third grade teachers have also made Tales2go an integral part of independent reading. Fifth grade teachers consistently have success with using Tales2go in reading groups and literature circles. Students who have difficulty accessing complex texts can listen to the books on Tales2go and take part in group discussions and written responses. Tales2go often has audio books included in the Maine Student Book Awards reading list, making it possible for more students at FES to participate in the program. Cathy is currently the chair of the AASL’s Best Apps for Teaching and Learning Committee and reviews apps for School Library Journal. 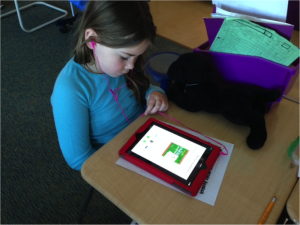 One school is using Tales2Go to help young readers enjoy more books than ever before. Ms. Alicea's class in North Carolina loves using Tales2go in their classroom, and the love has spread to the whole school! 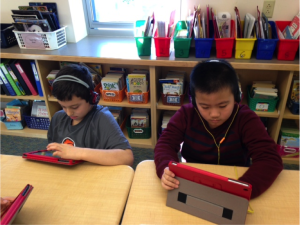 Listening to audio books helps comprehension immensely!